After firing four rockets at the city during the morning commute, Hamas sent another two - in time for lunch. A second set of missiles were fired at Tel Aviv Thursday afternoon. After four rockets were fired at the Gush Dan region at about 8 AM, two more were fired at about noon. All six were shot down by Iron Dome missiles. No damage was reported, although several cars were said to have been struck by shrapnel. One woman was treated for shock in Ramat Gan, Magen David Adom officials said. The earlier missiles were fired to coincide with the morning commute, as hundreds of thousands of people were traveling into the Tel Aviv area. Reports said that pedestrians headed into buildings seeking safe shelter when the sirens went off, while some drivers who were stuck in stop and go traffic attempted to pull over to the side of the road and find a place to hide from the incoming missiles. Homefront Command officials said that there were no reports of damage, while some reports said that several individuals were injured by shrapnel from pieces of the destroyed missiles that fell to the ground. Magen David Adom officials said that at least one traffic accident appeared to have been caused by the attack. A bus and passenger vehicle collided on Road 4 near the Geha Junction in Bnei Brak as the siren went off. No one was injured in the accident, officials said. Homefront Command officials appealed to Israelis not to congregate in the areas where pieces of destroyed rockets fall after they are exploded by the Iron Dome system. Such congregation is dangerous, the officials said, since Hamas terrorists could fire rockets at the same site after a crowd gathered, placing those at the scene in grave danger. Speaking to Israel Radio, the director of a kindergarten in central Tel Aviv described the “controlled panic” that the children experienced as they entered a bomb shelter. “We sang songs with them and the many adults that came in as well, and after a few minutes we went to the classrooms. We try to keep a 'happy face' on for the children, but it is getting harder,” the director said. The Iron Dome anti-missile defense system is used only against rockets that are seen to be headed toward populated or industrial areas. If the Iron Dome system judges that an enemy rocket will strike ground harmlessly in an empty area, the battery's operators usually opt to let the rocket fall and explode instead of wasting costly Iron Dome missiles on intercepting it. 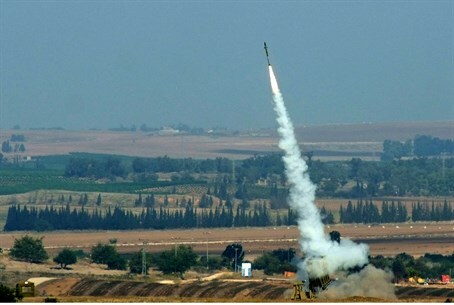 On Wednesday, Hamas terrorists fired long-range rockets that were able to reach the southern suburbs of Haifa. Sirens sounded near Haifa in Hadera, Zikhron Ya'akov, Caesarea and Hof HaBonim on Wednesday afternoon - at least 45 kilometers (almost 30 miles) north of Tel Aviv, and the farthest attack recorded from Gaza in the ongoing rocket barrage. Two rockets landed in the sea near Haifa, according to AFP, noting the city is 165 kilometers (102 miles) away from the Hamas stronghold of Gaza.